Blood and nasty green stomach matter gushed from her side. The Old Doe had been hit. The arrow flew from the old oak tree, just off from that feed plot where all the deer had been feeding all through the late summer and early autumn. It was aimed at her heart, and the doe was hit a bit far back. And now she was running wounded. Death was coming, but it wasn’t fast enough. The agony of the deer was now replaced by the terror and panic that she must run from the predator, the danger that that revealed its with that swishing arrow sound and the thud into deer flesh. She would not be long for this world, but it was not soon enough to remove her from the before the torture of this sort of death would set in. For seven years, the Old Doe had run these hills. Her mother was a wise old girl, who had dropped the Old Doe and a buck fawn in her fifth spring, and she taught her young ones the ways of survival in summer swelter and through the hard snows of winter. She taught them many to walk into the wind, so they could always catch the scent of what lay ahead, and she taught them to be most wary of man. For man is the only animal that can kill you if he has you in his clear view of sight, and if man can see you, you’d better run like hell. A pickup truck took her mother on a late March evening, when the doe took her young out to lap some vestiges of the road salt that had been dumped all through the winter. It was an ignoble death for such a wise creature, but it is a death that happens thousands of times on the highways every year. And the Old Doe became an orphan, but she had her mother’s wisdom, and she had her mother’s band to hook up with. 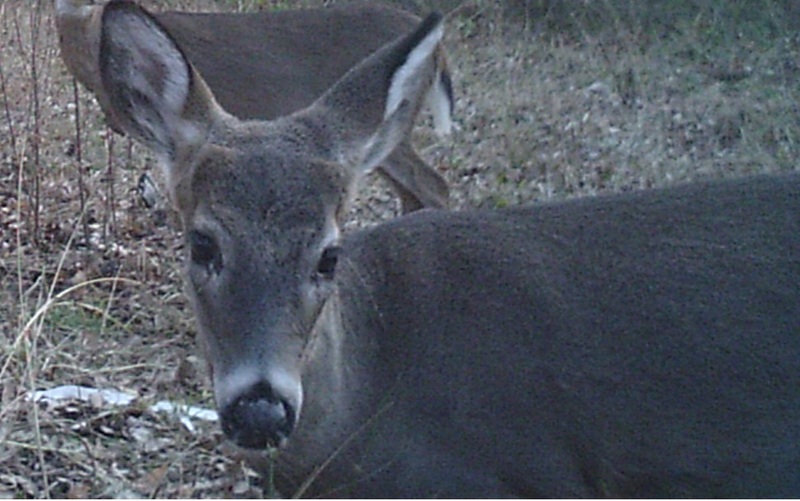 White-tailed deer live in little societies in which the mature bucks live in their own bands and the does and their growing offspring live in their own as well. The old does become really woods-wise, and they pass this knowledge onto their daughters, granddaughters, and nieces. The buck bands split up when the autumn makes their hormones surge into a state of insanity, aggression, and just plain libido. They run the country looking for estrus does on their own, and this is roughly the same time that men with rifles and shotguns show up and drop them dead as the course the sweet sensual scents of the rut. But the does stay together through most of this insanity. 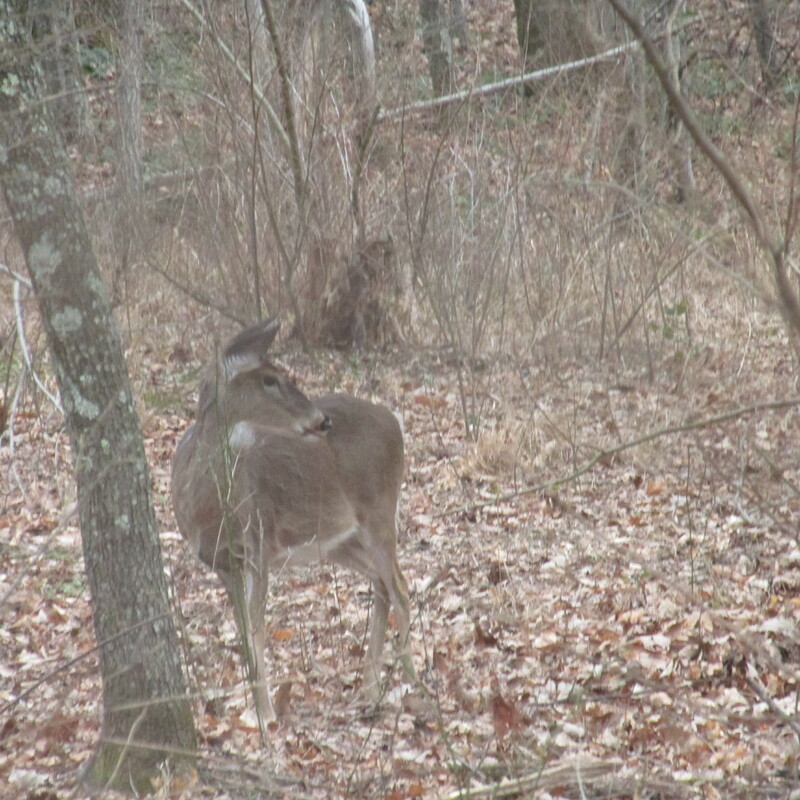 A buck might run a doe on her own for a little while, but she invariably returns to her sisterhood. The Old Doe learned from her mother’s older sister, who died at the age of ten, when her teeth were all ground down to the nubs, and there was no way that she could masticate an acorn or beechnut to feed her gaunt form. She starved to death on a late February day, and when she passed, the doe band’s leadership was passed to the Old Doe. And she ran the hills for four good years. Every hunter and homesteader in that part of the country knew her well. She was a big, stout doe, and she always dropped her twins in the sweet days of late May. They would follow her out into the pastures on midsummer evenings when the fireflies seemed to rise with the humid vapors of dusk. Two daughters made it through the gauntlet of slinging arrows and firing guns and speeding cars. They were her lieutenants, and by their second years, they were both dropping twins along with their mother. Coyotes and mowing machines got some. A bobcat got at least one. The hunters looking for tender meat always took the little fawns as soon as the hunting season started. The Old Doe lived a life in which death stalked everywhere, and it was always just a matter of time before someone was shot or impaled or lifted from a sleeping form. But she lived all through that horror, and her band thrived as well as deer could. 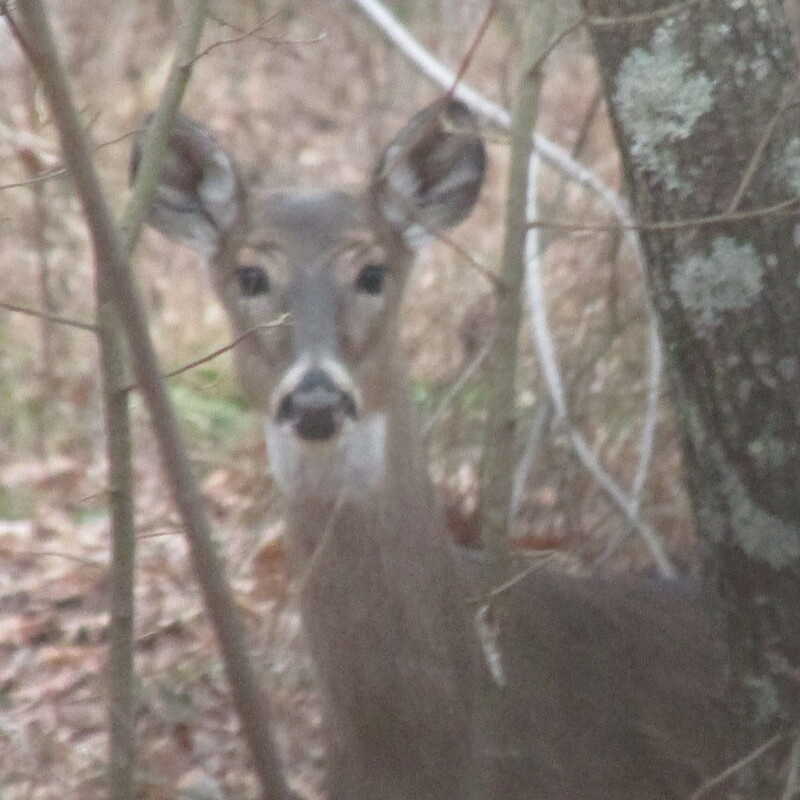 In the end, the Old Doe could only avoid a fatal error so long, and on that early October day, she led her band to her favorite food plot, and for whatever odd reason, she chose to slide in with the wind blowing behind her as she passed the big oak. The steeping sun occluded the hunter’s form as he drew back and let the arrow fly. He was a young man, fifteen years old and learning to be a proper huntsman. He had spent hours practicing in the range. He thought he had that arrow flinging down, and I suppose he did. Even the best of them sometimes shoot a little too far back. 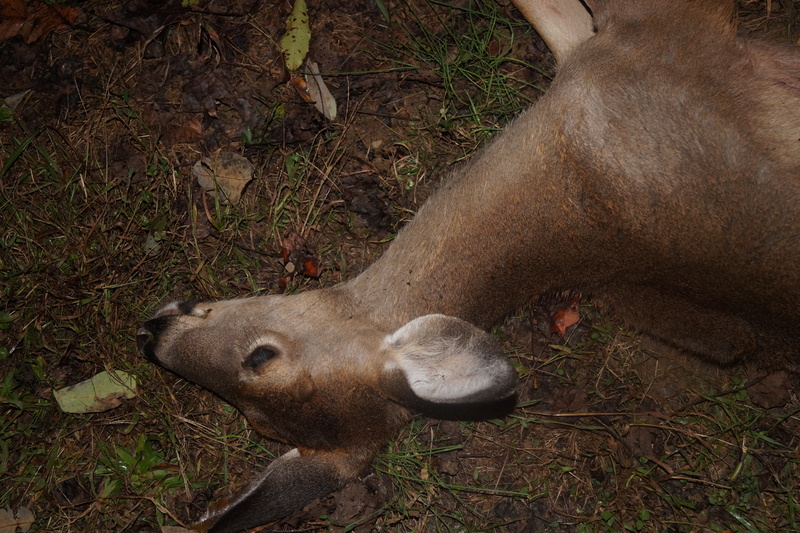 After the arrow thudded into her side and out the other, the Old Doe ran with her band for the coverts. But the loss of blood and the spurting green stomach matter slowed her advance. And in panic she ran as hard as she could. She didn’t know the direction. She just ran and ran. The thorns from the multiflora rose pierced her legs. She just ran and hoped that all the terror and pain would cease. And then she fell and fell hard. Her neck twisted the side. She flailed for about five minutes and bleated as if she were a lonely fawn calling out for her mother. And as she bleated, the strength sapped from her existence. Her sides rose and fell and legs flailed a bit longer. And all that knowledge of being a deer in these hills was wiped away. Minutes ago she was animate fur and flesh, and now she was a pile meat, hide, bone, and organs. The night began to drawn in around her body. A trio of roaming farm dogs caught her scent and trailed down to her final resting place. They tore at her hide, but not being experts at dissecting carcasses, they made a mess of the whole thing. Indeed, most of what they did was tear into her flank a little as they torn into each other as they fought over this bounty that they had suddenly discovered in this part of the dark woods. And so the Old Doe died, and her carcass was discovered that morning when the young hunter and his father managed to pick up her trail in the early morning sun. The meat was not whole, and the stomach contents had fouled most of the meat as she decomposed in the early autumn warmth. At least she wasn’t alive anymore to suffer, but her body would be left to rot and stink and feed the vultures, foxes, and opossums. They would live well off her body, for in death there can be promise for more sustenance, more life. And if nature’s rules are adhered to, all flesh goes to the carrion beetles and the decomposing bacteria. And so we can think of the Old Doe’s death as a tragedy, a wasteful death that ended a lifetime of horror. But the white-tail evolved to live lives of horror. They don’t have complexes about it. They simply live while they know of constant terror, and pass on what they know to their young. And they have done so for millions of years on this continents, millions of years before the first Siberian hunters came down from Beringia and took that first white-tail for a bit of meat. Their bodies have fed countless numbers of humans, and they’ve fed such teeming multitudes of predators that it would be foolish to count them all. And in the hills where they once grazed among the Mastodons and fleeted away from American cheetahs, they now live in the oak woods, where the rifles crack and arrows fly. They live their fleeting lives of constant terror. But they live them well and so nobly that few humans can ever approach their dignity, even when they fall in such folly as the Old Doe did. But it is the way of these creatures. Their evolution as prey made them be this way, and we must accept that their deaths must come, if not by the hunter then by the speeding car or horrific starvation. We live in interesting times. I think everyone who has ever lived has had this thought on his or her mind. Our times are always interesting. I guess because we’re living them and not any others. But to be alive in this century is to see what happens when the bulk of humanity is removed from the life processes that produced us and all other life on the planet. Our lives are very much alienated from the rest of living things. We know ecology only from what we see on television or read in books. Most of us don’t give much thought to how an overpopulation of deer can destroy a forest, and most of us don’t realize that coyotes are boon to songbirds when they kill feral cats. Nature is an abstraction. It is what lies beyond the greenbelts and stands of concrete and steel. Never mind that all of those things came from nature itself, and that all things are part of nature. Not a single thing that exists that you can see, touch, hear, smell, or taste is anything but nature or nature with some sort of refinement on it. Ever since we domesticated fire, we’ve had abilities that other creatures never could. With fire we can cook meat. With fire we can clear a patch of scrub and allow new growth to come in. And that new growth is good nutrition for ungulates. And ungulates are good nutrition for us. But we’ve come a long way from knapping flint into arrowheads and making fires with little sticks. We now have the capacity to change the climate or obliterate most of the world’s biodiversity with a few rounds of nuclear missile exchange. With this alienation has come a desire for an ethic, and as the world becomes more and more interconnected and more and more secular, there comes a questing for what is the true moral way to relate to the world. In this modern age, ideas about animal rights have come to the fore. More and more people are choosing the vegan or vegetarian diet, but from I’ve read, it has a high attrition rate. But there are questions about animals now that weren’t asked in the past. I don’t think this is a bad thing at all. We should be asking these questions. At one time, it was acceptable to dissect a live dog on a table, and his plaintive howls would be dismissed as being nothing more than those coming from a machine. But I don’t think we will ever have a world in which no animals are used for food or killed to protect crops or manage their populations. The idea that this utopia will come to pass is an utter pipe dream. We no longer live on the edge of wilderness. In fact, no one really does anymore. All that is wild and free really exists only because civilization either allows it or has no good reason to destroy it. And that which we allow to exist must be managed. I must confess now that I am what is called an adult onset hunter. I grew up hunting squirrels in woods with my grandpa, and I went deer hunting a few times as a teenager. But I didn’t feel connected to it. What’s worse is that I went through a bleeding heart stage during my college years. I was disgusted with the Iraq War, Republicans, and “gun culture.” I wanted nothing to do with killing animals. Around that same time, I watched a beloved dog die of brain cancer. I began to think about animals more and more. I read far lots of books by Jeffrey Moussaieff Masson about animal emotions, and I deeply admired his sensitivity toward animals. At some point in graduate school, I began to question the new animal rights ideas. I began to think more and more about the evolution of our species. We really weren’t much of anything until we learned to be efficient predators. We started hunting before we were fully modern. Homo habilis was hunting for meat 2 million years ago. And we know that humans were living off big game pretty much where ever we were. It’s an odd story that this one lineage primate would wind up competing with lions and wolves as the top predators, and it’s even odder still that we’ve largely dominated over them. That is what you get with a big brain, opposable thumbs, and a desire to hunt for meat. So if humans have spent that much of our evolutionary past as hunters and if we have all these game populations to be managed, isn’t ethical hunting the morally responsible thing to do? Hunting is in my ancestry, and you don’t have to go to Olduvai Gorge to find it. One of my ancestors was a German-speaking frontiersman by the name of Sommers (now Summers). He became a well-known bear hunter in the Northwest Virginia frontier and is said to have killed twelve bears before noon on a single day. He made his living as market hunter and fur-trapper but lost his fortune after investing in some bad public bonds. My family on both sides were hunting people. I come from the general sort of yeoman farmer-hunter-trapper that once populated most of America but lived long and legendarily in the Alleghenies. Both my grandfathers kept foxhounds at one point on their lives. My mother’s father was running hounds until his health began to fail, and my father’s father kept Norwegian elkhounds for hunting squirrels and varmints. They both loved hunting deer in the bleak November rutting time. I hunt because I am human, and I hunt to remember my ancestors, to honor my grandfathers and their grandfathers before them. It is a deeply personal thing that only someone who has had a grandfather who took them hunting can truly appreciate. Five years ago, if you had told me that I would be a hunter with a crossbow, I would have told you to get lost. Crossbows were illegal for all hunters but the disabled in West Virginia anyway, and I was really worried about wounding a deer a with an arrow. It was then that I became aware of the broadheads with expanding blades. When these broadheads hit the deer, they expand and make a pretty large hole in the animal. If you hit it in the right place, it quickly bleeds out and dies. There is none of this sticking the animal with an arrow and letting it suffer for a few days or weeks before it dies of infection. Further, West Virginia did legalize crossbows for general hunting purposes– for bears, “wild boar,” and white-tailed deer. I also discovered that the new crossbows were as accurate as a rifle at short distances. So with a crossbow, one can quickly and humanely kill a deer. All you have to do is be able to shoot a gun. And to sit quietly and watch the deer. The truth is most of hunting isn’t killing. It’s only the culmination of the act. Most of hunting is observing the animals, reading its sign, and scouting out its habits. You get to appreciate the deer as deer. You almost see them as a nation unto themselves, like a rebel band that lives at the edge of society but is never fully dominated by it. I can think of no greater satisfaction than watching a homely three-point buck smack down some chestnuts on a balmy October evening. It’s not about killing the deer. It is coming to know the deer. And that is why I hunt. I seek not the glory in the suffering of creatures, but I seek camaraderie with the old ways, the ones that are being lost now and have continued to winnow away as each generation passes. For a limited time, I am part of it. Look at the antlers on that stag! The Rage broadhead took him quickly. So one deer off my license for bow season. I also weighs only 14 pounds and comes in a backpack, and it also takes 5 minutes to set up. 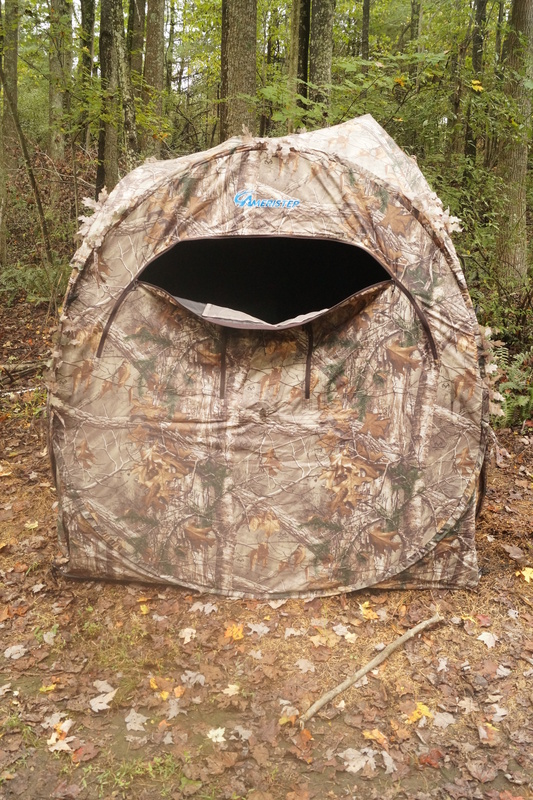 And you can shoot a crossbow or a compound bow inside it! I’m not here to revel in gore. Deer populations have to be managed, and last year, the bumper white oak acorn mast meant that many more does than normal would have twins. This year’s acorn mast isn’t as impressive, which means lots of little dear like this button buck will starve to death, wind up hit by a car, or eaten by coyotes. In the dead cold of February, when the acorns are all gone, he won’t be among those starving. And his share of food will go to a more wary deer. That’s how it’s gone on for millions of years, and humans have been hunting deer here for maybe 13,000 years. And it will continue on. I have to admit that I’m not as much into killing deer as I am stalking them. I love remaining still enough so I can get some very close photos!